I have been on a roll with fermenting lately, so I thought I would share this easy recipe for fermented garlic with you as well! Garlic is known to have medicinal properties and an overpowering taste. 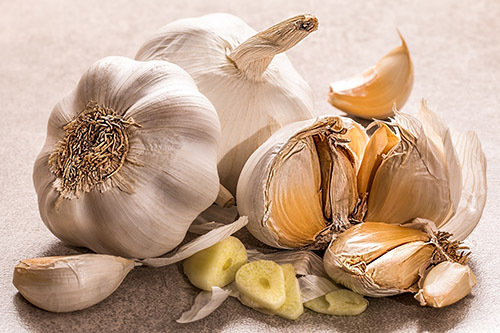 Fermented garlic is healthier and more comfortable to eat than raw garlic due to the spiciness of the garlic mellowing out during the fermentation process. Fermenting garlic also adds probiotics which increase vitamins and improve digestion. Let's get started! Break the heads of garlic into cloves and remove as much of the husk as possible. Put the cloves of garlic into a mason jar, leaving an inch-and-a-half of space at the top. Create a salt brine by dissolving the salt in the water. Use ½ teaspoon of sea salt for each cup of filtered water. Fill the jar to within an inch of the top with a salt-water brine. Place a weight on top of the garlic to keep it submerged. A glass disk works great, but a small plastic bag filled with water, or a clean-scrubbed rock works as well. Close the mason jar. If you are using a regular canning lid on the jar remember to release the built-up gas every other day or so. Otherwise, consider using an airlock lid or a Fido jar so you can store it and forget about it for a while. Store the jar in a cupboard or cover it with a cloth to keep out light, and leave on your countertop. When you start to see tiny bubbles in the brine, you will know that the fermentation process has begun, which can take up to a week. The brine will also start to take on a nice golden-brown color. Let the garlic continue to ferment for at least a month. This is where patients pay off. If you can stand to wait at least two months, you will have a jar of the most mellowed and delicious garlic flavors you can imagine. When done, screw the lid on firmly and put it in the fridge to store. Fermentation will continue in the refrigerator, although at a much slower pace.